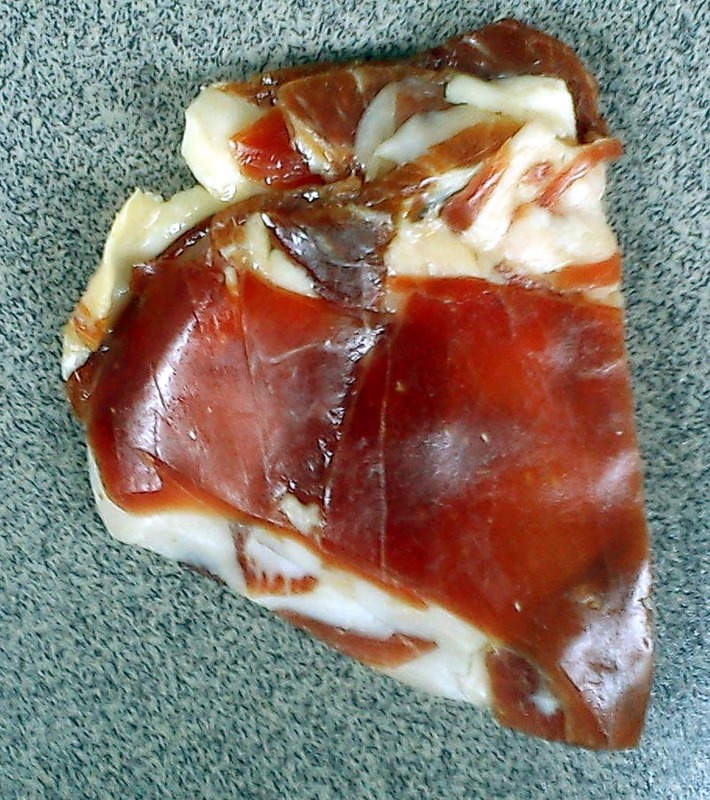 Jinhua ham (金华火腿) is a dry-cured ham from Zhejiang Province in eastern China, specifically from the town of Jinhua. Along with Rugao ham (如皋火腿) from Jiangsu Province and Xuanwei ham (宣威火腿) from Yunnan, it is considered to be one of China’s top three hams. 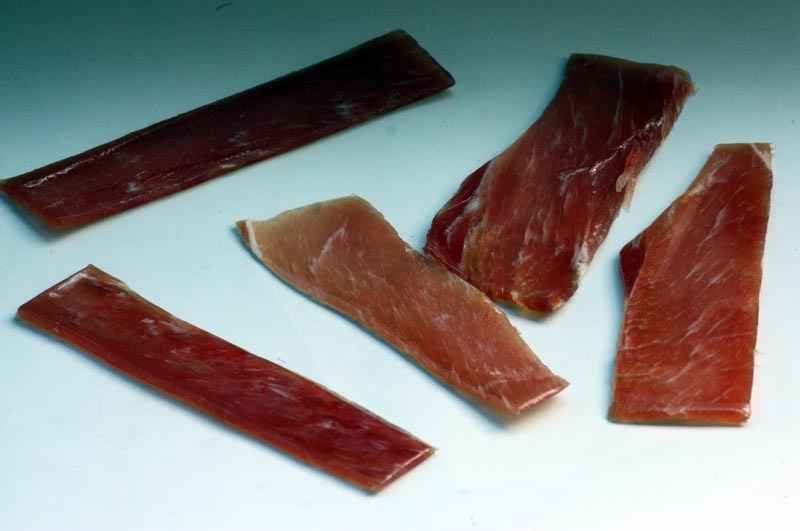 I’d go even further and suggest it is one of the world’s best, alongside the Spanish greats such as Jamon Iberico. It has even been suggested, somewhat implausibly, that Marco Polo took the production process to Europe and kick-started European ham making. 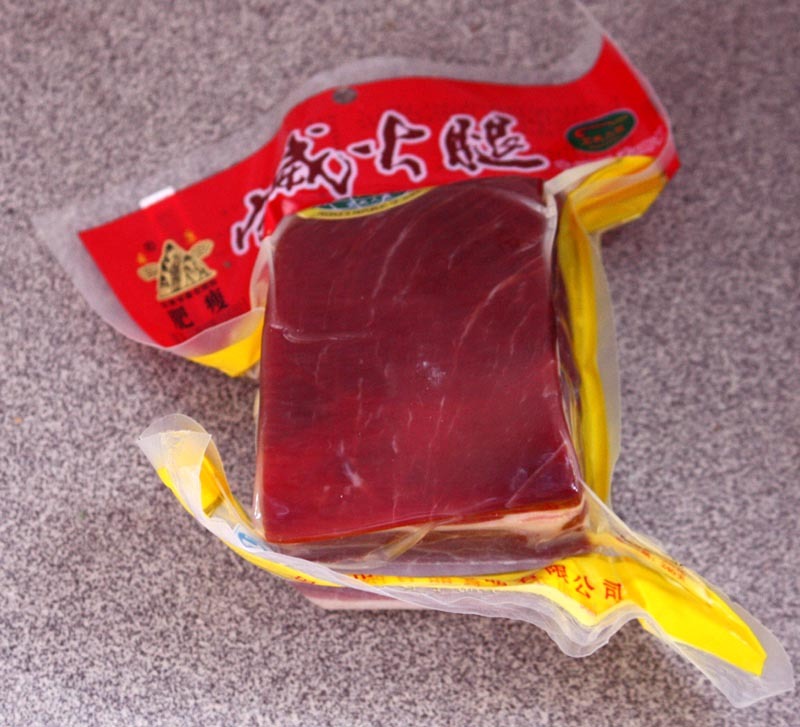 Jinhua ham is made from the rear legs of a breed of pig native to China. Production starts in winter and takes up to 10 months. The traditional process is at least 1,000 years old, and consists of salting, soaking, and ageing the hams. Traditionally, Jinhua ham is added to stews and braised dishes to deepen the flavour. It is also used extensively in stock making. It is also a key ingredient in the dish known as “Buddha Jumps Over the Wall”, a type of shark’s fin soup, a dish recently banned from official banquets by the Chinese communist party and falling from favour elsewhere. However it can be used in many ways. I have used it with spinach in pancakes, in omelettes, on pizza, with noodles etc. 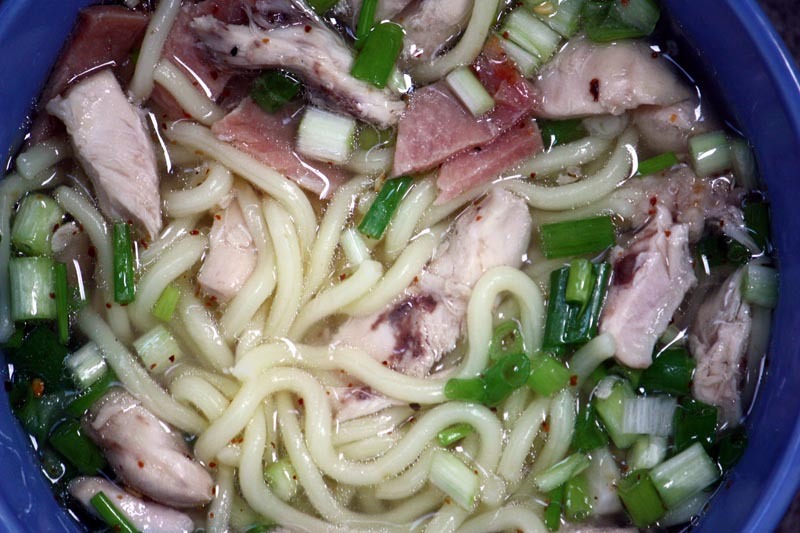 Jinhua ham and chicken noodles. But most often I just eat it straight from the pack. Delicious. 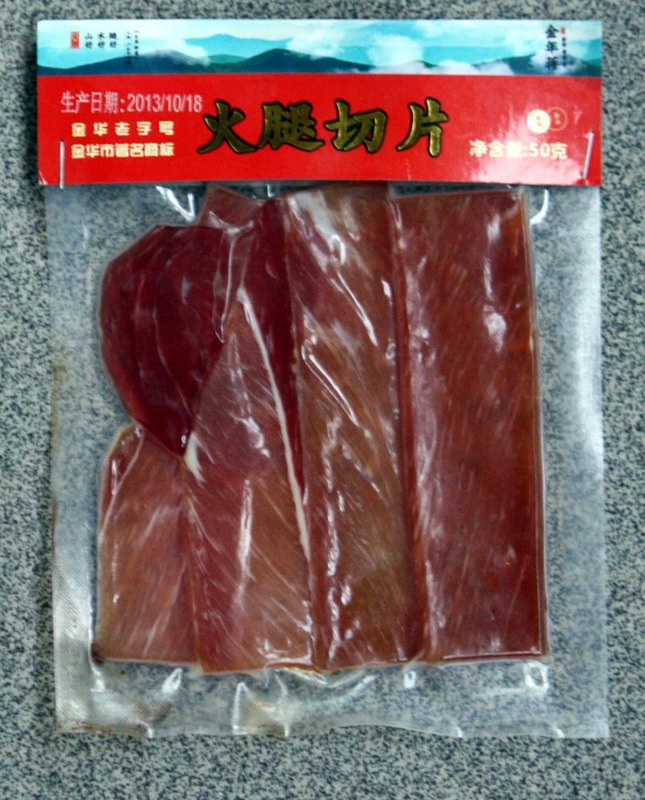 Jinhua ham is available pre-sliced in Liuzhou. It comes in 50 gram packs which sell for ¥5.80. It is also available in 500g blocks for ¥60. Whole hams appear in the supermarkets in time for the major festivals, especially Spring Festival. Expect to pay near to 300元 for a whole ham. I’ve never come across Rugao ham in Liuzhou. Xuanwei, occasionally, although a friend from Yunnan did bring me a whole Xuanwei ham a while back. Bliss.
. This entry was posted on Friday, December 20th, 2013 at 7:00 am	and is filed under Food and Drink, Friday Food. You can follow any responses to this entry through the RSS 2.0 feed. Both comments and pings are currently closed.